It is good to see Carl Nielsen receiving due recognition in this his 150th anniversary year and not being overshadowed by Sibelius. We have had at least three recordings of his symphonies issued this year, including one on this label by these artists. For me Nielsen is equal in all respects to his Finnish counterpart, but I did not always feel that way. It took me quite a lot longer to really understand and appreciate the Dane. However, the more I hear his music the more I consider him one of the greatest composers of the past century. Although he may be considered primarily as a symphonist, much of his other music is at the same high level. This is particular true of his three concertos recorded here. Like Sibelius, Nielsen was a violinist and his Violin Concerto demonstrates this to great effect. It even begins with a cadenza and has commanding parts for the instrument throughout the work. Where the Sibelius is dark and maybe a bit dour, Nielsen’s is bright and optimistic with some of the composer’s trademark humor. It belongs to the period of the Third Symphony and like that work has many melodic passages that stay with one long after hearing the piece. While the Sibelius concerto caught the public’s attention early on and has been an audience favorite ever since, Nielsen’s has only in recent years achieved some level of popularity. My introduction to the work was through a fine recording by violinist Cho-Liang Lin with the Swedish Radio Symphony under Esa-Pekka Salonen coupled with an equally worthy account of the Sibelius concerto (CBS/Sony). I am still very fond of that disc, but I must admit that this new one with Nikolaj Znaider and the New York Philharmonic/Alan Gilbert trumps it in the boldness of their approach and in the superb recording Dacapo contributes. After the opening blast by the orchestra, Znaider takes command and doesn’t let go. He varies his tone, as the music requires, from big and fruity to soft and silvery. The second part of the first movement, marked Allegro cavellerésco, has all the knightly swagger one could wish. There the New York Philharmonic’s winds excel, in particular Philip Myers’ ravishing horn solos, demonstrating Nielsen’s ability as an orchestrator par excellence. The second movement with the oboe and horn introducing the violin in its wistfulness contrasts with the earlier movement, and the finale brings out the composer’s humor in its boisterousness and high spirits. Znaider/Gilbert are rather quicker with the initial theme here than Lin/Salonen, and their lighter touch really appeals to me. I compared both accounts to another by Dong-Suk Kang and the Gothenburg Symphony with Myung-Whun Chung on a BIS CD that contains the same programme as this new one. I found Kang/Chung, while perfectly good, to be more ordinary and lacking the sheer esprit of the other two. After the success of his Wind Quintet of 1922, Nielsen decided to write a concerto for each of the members of the quintet. It is unfortunate that the composer did not live long enough to fulfill his ambition. What we have, though, are arguably the two greatest concertos for their respective instruments, flute and clarinet, since Mozart’s. Unlike the Violin Concerto, these works are for reduced orchestral forces and much more modern than the earlier concerto. Nielsen composed both after he completed his last symphony. The Flute Concerto with its use of solo bass trombone and timpani resembles the Sixth Symphony to a certain degree in its quirkiness. Jens Cornelius aptly describes its style in his informative notes in the disc’s booklet: “[It] is restless but precise, with incisive humour but a warm heart.” In addition to solo flute, the concerto is scored for two oboes, two clarinets, two bassoons, two horns, bass trombone, timpani, and strings. By turns witty and mordant with contrasting lyrical and stormier, march-like passages, the work finds flutist Robert Langevin and Gilbert’s orchestra fully engaged throughout the concerto. Again the sound is terrific and one can hear all kinds of details in the orchestra that would otherwise go unnoticed. This was made clear to me when I compared the recording with the earlier one by Patrick Gallois on the BIS CD mentioned above. There is really little to choose between the two soloists. Both Langevin and Gallois have the measure of the music and play with a vibrant and pleasing timbre. The orchestral part under Chung, however, pales in comparison with that of the New York Philharmonic. Not only do I prefer George Curan’s bass trombone sneers in their immediacy, but also the clarinet accompanying the flute’s first solo cadenza has more presence. The Clarinet Concerto was one of Nielsen’s last compositions and among his most radical works. 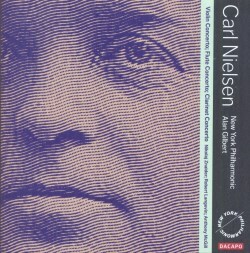 As Cornelius notes, Nielsen was attracted to the clarinet as a boy from “an old blind folk musician who showed him how the clarinet could both weep and laugh.” The composer really puts the clarinetist through his paces in this concerto, whose structure is one continuous movement with four contrasting sections. This disc has it divided into three tracks, while the recording by Olle Schill and Chung on the BIS CD is in one track. The Clarinet Concerto has even sparser scoring than the Flute Concerto: besides the solo clarinet, there are only two bassoons, two horns, snare drum, and strings. If the Flute work evokes the Sixth Symphony, this one recalls the Fifth. Here the snare drum plays an even greater role than the bass trombone did in the Flute Concerto. Overall, the Clarinet Concerto is the more serious work, though it does contain sardonic humour. The bassoons have a memorable duet early in the piece, further making one wish the composer could have written a concerto for that instrument as he intended. Near the end of the concerto, there is momentarily one of those big Brahmsian themes that Nielsen seemed to love. My comments concerning the performance of the Flute work also apply here. One couldn’t ask for a better soloist than Anthony McGill. His performance is awe-inspiring and he plays with a penetrating, woody tone that he varies as the score requires. Olle Schill is also excellent, but the orchestra does not leave as strong an impression. No doubt this is partly due to the recording, but Gilbert also seems more engaged than Chung. The horn and bassoon parts are clearer and make more of an impression in the New York performance and the wild, march-like section (track 3, from 7:00) makes a bigger impact here. The strings are not shortchanged either, with their “sighing” particularly noticeable within the last minute of the work. The recording is impressive in only two channels, but I look forward to hearing the performances again in surround sound. Dacapo’s production is fully in the luxury class. Besides the excellent notes, the booklet contains the usual biographies of the performers, a complete list of the New York Philharmonic musicians, and colour photos. In every way this SACD is a winner and a fine conclusion to Alan Gilbert’s Nielsen cycle.